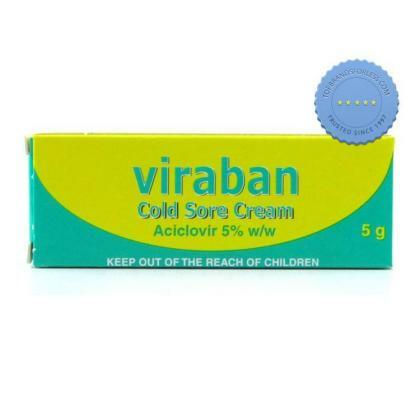 Viraban Cold Sore Ointment contains Aciclovir 5% and can be used at the first signs of a cold sore to speed healing and help stop the herpes virus from reproducing and causing further infection. Qty FREE International Delivery on all regular sized orders when you spend over $120. Viraban Cold Sore Ointment 3g fights cold sores by helping to relieve the infection caused by the virus, while shortening the healing time for the cold sores that are visible. It can be used at the first signs of a cold sore to help prevent further damage. It contains the active ingredient Aciclovir 5%. Apply a thin layer of ointment to the affected areas, five times a day for five days. This can be used as soon as the first symptoms of a cold sore appear, such as burning, tingling or itching. It is important to continue using ointment for the full time of treatment (five days), even if your symptoms begin to clear up after a few days.